mwe3: The Paidarion CD Behind The Curtains sounds great. It seems to draw on a number of musical influences including progressive rock, instrumental fusion and there's also a cool Finnish music vibe in play. 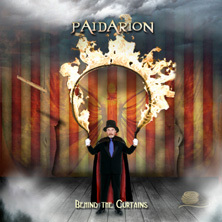 What did you set out to achieve on Behind The Curtains and how does this second CD fit into the original concept of Paidarion and can you compare it to the first Paidarion CD? Jan-Olof Strandberg: The first Paidarion album Hauras Silta was meant to be more like a project album, not really a live group. Kimmo Pörsti and Pirkko Salhi started the project. They had a lot of musical ideas and material they wanted to record and share with people. Finally in 2008 they invited friends to the studio for the recording sessions that then became Hauras Silta - Paidarion's first album. The album was released in 2009. Soon after that we started to discuss about taking Paidarion to the next level and make it a real group that would tour and record regularly. It was important to have dedicated members and musicians with the same kind of goals. Everyone in the group writes music and comes from different musical backgrounds but all share the love of progressive music. Kimmo Pörsti: You are absolutely right; there are a lot of musical influences mixed into our music. You could say that our goal was to make the music of as high quality as we can; the music that you hopefully can listen to many times without getting bored. However, it was not our goal to make very complicated prog stuff just because it is complicated. For me the feeling is always more important than trying to impress the listener with technical ability, and it is no use as there are always technically better musicians around. As I had found a great bunch of musicians, my goal was also to let everyone be just who he and she is and not try to hide it. For example, Risto is a professional saxophonist who plays a lot of musicals and swing/dixieland type of music, Kimmo Tapanainen is a classical pianist, Jaan is perhaps more into jazz, well, he can play many styles and Jan-Olof and me are maybe more fusion / prog oriented. So I wanted to put all those different backgrounds together and see what happens. As always with my projects, no rhythm machines or sequencers etc. were being used. For me it is very important that every note is played by human hand, mistakes included! mwe3: How would you describe the sonic chemistry between the players in Paidarion? On Behind The Curtains what was the song writing and recording process like as far as each of the band members contributing and how do the lyrics by Pirkko Salhi fit into the musical concepts of the band? Kimmo Pörsti: I think we are lucky to have a mutual respect and understanding between different musicians in the group. The song-writing process was kind of a two-way thing: Firstly, I had already made compositions, like Small Wish and Vertical Rope, some years ago that were almost complete, but something important was still missing. And when I presented those compositions to Jaan, Kimmo and Jan-Olof, they were able to finish them off in a surprisingly easy way. So, I just couldn't have done it alone by myself. With A Rose In The Sun I already had a melody line there, but Elina adjusted it to fit her voice better and Risto plays the original melody along with Elina's melody. As opposite to our first CD Hauras Silta, where Pirkko had already some finished lyrics and I composed them after that, this time we mostly made the music first and then came the lyrics. I think Pirkko's lyrics fit very well with the musical concept of the band because she really takes her time to search and find the essence of the compositions before writing the lyrics for them. Secondly, there were also some tracks that were made almost at the time we recorded them. With Trapeze and A Leap into the Unknown I only had made some melodies and ideas and we finished them with close cooperation with Kimmo T and Jaan. Jan-Olof Strandberg: Everything came out actually quite naturally in the end. We thought about what kind of songs we would need and how they would be placed on the album. How to tell a complete story with music and words how to make them fit? Here Kimmo and Pirkko had of course a big role. Kimmo did definitely do the biggest job and made everything fit! We did choose the musicians for the group because of their interesting background. Like Kimmo Tapanainen who is a trained classical pianist but also loves progressive music. The great thing here is that instead of bringing in the typical jazz piano player who would play all kinds of jazz chords, Kimmo T brings another angle of how to approach the songs with more of a classical piano kind of approach and that was very much needed here! Jaan Jaanson is a jazz player who loves odd time signatures and a folk music kind of approach and is a great composer as well. He was perfect choice for this group. We wanted to create something new, without forcing it, but using creative musicians with visions and who would fit the group otherwise, too. mwe3: The instrumental tracks on Behind The Curtains also sound quite interesting including the brilliant CD closing track (very Pohjola-esque) called The Final Show. How would you compare writing and recording instrumentals compared to the vocal tracks? Do you have a preference? I like the blend of the vocals and the instrumentals on the CD. Jan-Olof Strandberg: Yes the blend between vocal tracks and instrumental tracks works quite well. The thing is that on Behind The Curtains there is a story that goes on from song to song, the whole record is actually a complete story by Pirkko Salhi. The compositions are important in this band, improvisations too, but we start mainly from the compositions and try to make a certain atmosphere so its really important that the compositions are made for this band. A certain mode is important for us, and also how the compositions would fit the whole album. Kimmo Pörsti: I like to make both the instrumentals and vocals tracks as well. Somehow I feel they do support and complete each other. So perhaps I really don't have a preference. It is funny that I really meant Vertical Rope to be an instrumental...it was hard for me to think of it with vocals. However, Elina told she would really like to sing it, so Pirkko made lyrics to it in a short notice. After I heard Elina singing it, I could really understand, why she wanted to do it! mwe3: Can you say something about your gear and what equipment youre using on the CD? Jan-Olof Strandberg: I always try to use the equipment I think is the best for the session and fits the songs best. As I remember I was using Alembic Series two 6-string bass on the opening track on Behind The Curtains. The fretless bass on the album is an Alembic Signature 4 string. 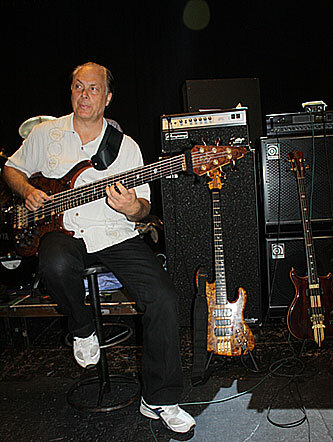 I did also use Alembic Series one 5-string, Alembic short scale, Fodera 5-string and a Neuser bass. I recorded the stereo basses with two Ampeg tube DI-boxes and then to the desk, and the mono basses with Alembic F1-X tube pre-amp as far I remember. Well this is how I record most of the time but also direct to the mixing board, depending on the studio. Strings are R. Cocco or Elixire and live gear are mostly Ampeg Pro4 or Pro8 with two Ampeg Pro-Neo 410 and two Ampeg Pro-Neo 115 speaker cabinets. I also shift between them sometimes only two 115 or then some other combination depending on the situation and venue. I also use TC and AER gear from time to time, but with Paidarion mostly Ampeg. Kimmo Pörsti: At the time of recording I was using Kumu drums (handmade in Finland); at present I am using Yamaha recording customs and Kumu drums. 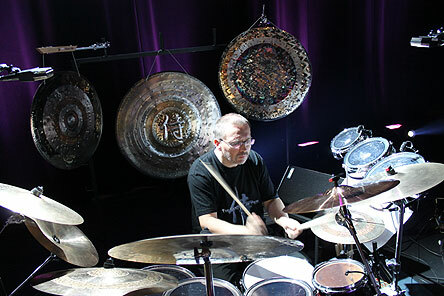 I am using mostly Ziljdjian and Istanbul Mehmet Cymbals. I have quite a few rides as I like to change the ride cymbals according the track I am playing. At present I also use Kimerism gongs. mwe3: What influence does Finnish music history have on the Paidarion sound? How influenced are you by early Finnish music history (even going back to Sibelius and the Kalevala) and in more modern times, legends of Finnish music including the late great Pekka Pohjola and the other musicians from that first generation of Finnish progressive rock musicians? (Wigwam, Tasavallan, Finnforest etc.) How about your other musical influences, then and now, from the various yet connected worlds of global rock and jazz? Kimmo Pörsti: Finnish music history does have a big influence for me! Well, maybe the classical Finnish music has not been that big of an influence for me personally, but Pekka Pohjola and Wigwam have had an enormous impact to me. I do recall buying Wigwam's Being LP as a young teenager. I decided to listen it as long as it would take to understand what's going on. (lol) And that's what I did! It still sounds as good as back then. Pekka Pohjola's first four albums are still some of my all-time favorites. I do have a lot of other musicals influences, too. The list is very long - here are just few examples: PFM, Kenso, Stuff, Jean-Luc Ponty, Lee Ritenour, Supertramp, Steely Dan, Keiko Matsui, Focus. Camel is one of the biggest influences for me and many times I have heard people comparing our music to Camel's. 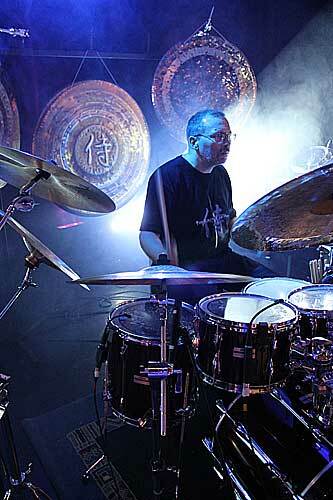 Recently I have been fortunate to work with Camel's Guy LeBlanc with the other group where I play, The Samurai of Prog. Dan Fogelberg has also been very important to me, unfortunately almost nobody knows him in Finland. Both Camel and Fogelberg are so good in expressing different moods and feelings. But my musical taste is broader than that; sometimes nothing sounds better than a good Bluegrass or Gypsy-jazz and some hard-rock bands from the 1970's - like Spooky Tooth and Three Man Army still sound as good as they did back then. Jan-Olof Strandberg: I was growing up when the rock/jazz revolution was happening worldwide in the late 1960s. Yes, the early Finnish prog groups have been an influence for me, too and I still play with Jukka Gustavson (Wigwam) from time to time and have recorded with Jukka Tolonen (Tasavallan Presidentti) and with Pekka Pohjola (Wigwam) and some other artists from that era. Today I do listen to the same plus many more like the great African players, Dream Theater, Hiromi, James Taylor and many more...there are just so many great artists and groups out there! But I think that if we speak about Finnish influences it all goes back to the way music has always been in Europe. There is a really strong classical music background that they teach early in schools where you learn about the European music history. In the 1960s and 70s jazz or rock was hardly ever mentioned in classes! Pekka Pohjola was from a classical musical family and he used his skills for rock instead of classical music. So basically if you write for a chamber orchestra and change the instruments to electric instruments and add some drums you will sound like progressive rock band! Again... the way harmony and melody is used it comes from Europe and all the blues and groove influences are from America, this is the mix for Finnish progressive music in my opinion. ECM records made some interesting sounding European jazz records in the early 1970s. That was basically the same mix, melody and harmony was the king, this time mostly improvised, not groove or blues, so the music sounded more meditative. Of course this was not for everybody but it definitely was nice new approach to the jazz! Today we hear more and more interesting mixes with African music and other cultures. In Europe we always had a strong sense of harmony and melody. Melody is the king in European music. 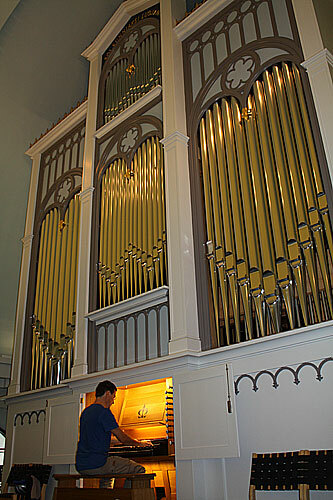 American music is about swing, groove and it is often blues influenced. I guess for a young musician in the early days the mix between America and Europe is what we have in progressive music. mwe3: Who else was involved in the making of Paidarions Behind The Curtains album? I see Michael Manring is one the CD too and there were other guests on the CD. How did you connect with Michael Manring and who else would you cite as being important in the making of the Behind The Curtains CD (musicians and otherwise) and can you also say something about the CD artwork and what it symbolizes? Jan-Olof Strandberg: Michael is a friend of mine from many years back. I have been at music trade shows all over the world since late 1980s and have met a lot of great players like Michael there. After the recording we spoke with Michael about a tour and he agreed to do a tour with Paidarion in 2011 and we are going to do another one this summer. Michael is a great musician and a sweet guy, really nice to perform with him. The artwork on Behind The Curtains is based on the story that is told on the album and the artwork is created by the great Davide Guidoni. Kimmo Pörsti: My bandmate from The Samurai of Prog, Steve Unruh, played some wonderful violin for couple of tracks. Another guest from the U.S. was Supernal Endgame's Rob Price, who sings with Elina in Small Wish and Magician's Departure. Olli Jaakkola played flute as he did in the first album. Way back in 1980's I was working for Finnish Television with Mika Syväniemi. We made music for children's programs, animations and such. As Mika is a wonderful composer, I asked his permission to work on couple themes of his for the album... that's how we developed The Final Show and Paidarion. As with many other projects of mine, my friend Tommi Liuhala did the mixing and mastering. Tommi is the grand old man of Finnish Prog. For example, he recorded and co-produced Live Music from The Twilight Zone in the 1970's, Wigwam's last album with Pekka Pohjola and Jukka Gustavson. Yes, the artwork for the album was based on Pirkko's lyrics. They deal about the life in a circus but naturally there are a lot deeper meanings in them. She had clear ideas how the artwork could support the lyrics and Davide did wonderful job fulfilling those wishes. mwe3: How is Paidarions CD being regarded in Finland and what do you think about the state of the current pop, progressive and jazz-rock music scenes in Finland and also in other countries in Scandinavia and other parts of the world? What else is new and interesting in Finland in 2013? Kimmo Pörsti: As with many other Finnish prog bands, most of our sales come from other countries. However, the response we have received in our concerts in Finland has been warm and encouraging. Perhaps I am not the right person to comment about the state of pop music in Finland or elsewhere as I have this personal problem concerning machines playing music. (lol) But even though you don't hear them in radio, I think there are probably more prog and jazz-rock bands around than ever. And many of them are very good! Quite often the best bands are the ones who are able to combine some of the musical history of their country into their music like Kenso. mwe3: What other activities keep you busy when youre not making music, including session work, hobbies, recreational things and other things? Kimmo Pörsti: I must say that there is no free-time problem for me: there isn't really much free time besides music. What comes to session work I have been fortunate to be asked for different music projects. Marco Bernard (from Colossus and The Samurai of Prog) has always something extremely interesting going on for me. A little while ago I finished recording drum tracks for Cosmic Remedy, a project led by very talented guitarist from Romania, Akos Bogati-Bokor. He has succeeded to combine Prog and the 1960's feel so well, that I am really waiting for the CD to come out. mwe3: What does the future hold for Paidarion and what are you planning as far as writing, recording and performing music in the second half of 2013 and beyond? 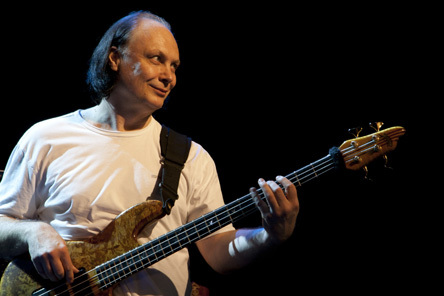 Jan-Olof Strandberg: We are planning on making a live DVD with Michael Manring this year or next year. We have three concerts coming up with Paidarion featuring Michael Manring this summer. We are also planning to begin the recording for a new album later this year. We are not in a hurry, we want the quality of Paidarion records to be as high as we can.